On 25 April, Carli applied to Grace Hospice, a 12-bed free-standing palliative care unit just south of Grace Hospital. Carli, Denise, and Hartmut had taken a tour of the hospice in the days preceding her admission to Riverview and all of them were impressed with what they saw. A bed opened up for her on 30 April and on 1 May 2007, Carli was moved across town to the newly-constructed facility on 260 Booth Drive that was built on the same property where the Salvation Army's Lindenview Residence had stood for many years. Room 5 became her new home, overlooking scenic Sturgeon Creek, Grant's Old Mill, and Portage Avenue. 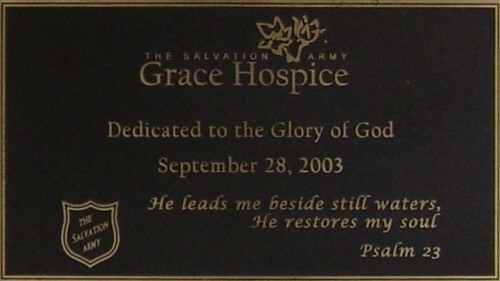 Opened in 2004, The Salvation Army Grace Hospice is an 18,000 square foot, state-of-the-art palliative care facility with 12 resident rooms. The Hospice provides an environment of peace, compassion and comfort. Specially trained staff and volunteers offer respectful, responsive care that reduces pain and suffering, while facilitating personal growth and healing in the last days of life. The Hospice is designed to promote a home-like atmosphere, as well as facilitate participation in supportive community life. Each spacious resident room features a beautiful view of the grounds and Sturgeon Creek, and is equipped with a television, microwave, coffee maker, telephone and private bathroom. Each room also includes a pull-out sofa bed, and family members are welcome to stay any time they wish. Residents and families are encouraged to personalize their room as much as possible. Other special features of the Hospice include a Chapel, quiet room, living room with gas fireplace, family dining room, children's play area, sunroom and patio. Weekly chapel services are held and chaplaincy service is available. The Hospice is part of the WRHA Palliative Care Program, which responds to people living with a serious and progressive illness. Family needs are integrated into care planning and support extends further in the days and weeks after a loved one has died. The Grace Bereavement Care Program is a valuable service provided to family members of patients in both the Hospice and Hospital. Staff and volunteers provide special support to those who have lost loved ones, including memorial services, support groups, drop-in groups, educational resources and regular phone contact, if desired. At the hospice, she was able to make the most out of her last months of life. Hartmut had moved her computer into her room, and arranged for an Internet connection to give her all the comforts of home. In her first couple of months there, she was even able to get outside for walks around the area. She went to two Goldeyes games during the summer, attended church services on occasion, and was able to get out on a shopping trip to Polo Park Shopping Center. She spent time at her computer, devoted some time to editing pages on Wikipedia, and enjoyed many games of Mah Jong Solitaire on Yahoo!. Carli had two exceptionally meaningful outings during this time, the first of which was a day trip out to Gimli in late June. She lived near Gimli for 1½ years and took many good memories with her when she left. Carli, Denise, and Hartmut drove up to the heart of New Iceland in the early afternoon and made the rounds of places Carli used to frequent. The highlight of the day was the stop at the school where Carli attended Grade 11. She spent a lot of time there meeting up with some former teachers in an important trip down Memory Lane. They also drove out to the homestead where Carli lived with Linda. It took some work to find the place, but Carli knew exactly where it was and directed Hartmut right to the very spot. They spent some time there and took some pictures for posterity. Naturally, it wouldn't have been a complete Carli trip without a slurpee, and she took care of that at the local Husky station. Of equal significance was the Terry Fox Run at Assiniboine Park on the morning of 16 September 2007. Her father, Gary, flew in from New Brunswick for the weekend to be there and to push Carli in her wheelchair, accompanied by both Hartmut and Curtis. She wasn't doing well that weekend, and it was even touch and go as to whether she could make it, but with some Gravol to settle her stomach, she made it, and didn't even need the barf cup she took with her along the journey. In what would be her last Terry Fox Run, she raised over $700 for the Terry Fox Foundation, more than doubling her previous high in any past year. As time went on, as expected, Carli's health slowly deteriorated. She had lengthy bouts with nausea, there was ongoing pain in her leg, the same problems with drainage through her catheter tube followed her from Riverview, and she developed a blood clot that caused her foot to swell up to almost double its normal size. She was on many different medications in these months, but, despite her declining state of health, defying the odds, she continued to bounce back time and again, showing everyone around her what a tenacious will to live she had. The skeletal figure that was laying in the bed in Room 5 was showing strength that 300-pound football players couldn't match. In late November, however, Carli's condition reached a point that even she wasn't going to be able to rebound from. She was no longer able to eat solid foods, and the only source of nutrition she had was coming from energy drinks and apple juice. She couldn't even muster much energy to speak anymore, and it reached a stage that she couldn't even handle the energy drinks. Still, she managed to maintain a firm grip on what remained of her life and even found the strength to ask for a slurpee on 8 December. That slurpee that Curtis got for her would be the last one she would be able to get down on her own. In the coming days, however, she had to be fed water with a sponge. Linda came in from Red Deer, AB to help out with Carli's care, and, between her and Denise, they kept a 24-hour vigil at Carli's bedside. 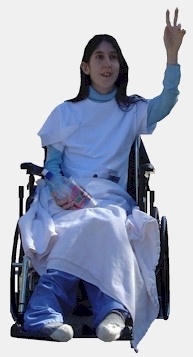 On the morning of 15 December 2007, after a rough and painful time the prior night, Carli passed away peacefully with Denise and Linda at her side, and Curtis arrived minutes later. The three of them stayed with Carli and reflected on the end of a 7½ month stay at the hospice and of a 25-year-old life. Despite the tears that flowed, it was a time to recall the fond memories of Carli and the impact she had on everyone who knew her. As Curtis remarked at the time in reference to Carli, “she's the toughest person in this room”. Carli had suffered so much in her last few months and even more so in her last few weeks that her passing was almost a blessing. A promising life had ended, but so had her pain and suffering.